The Thos. 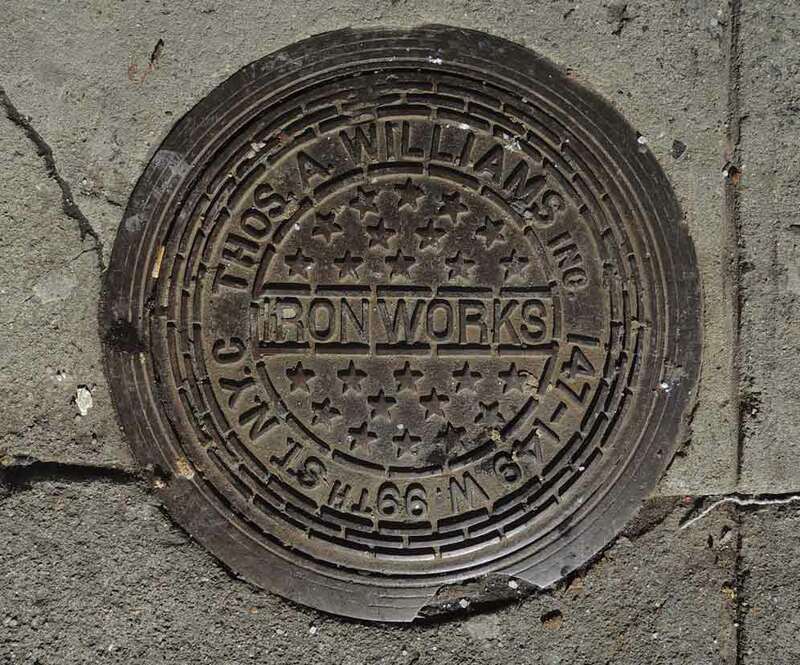 A. Williams Iron Works were located at 147-149 W. 99th St. from 1918 to 1926. A previous location was across the street at 160 W. 99th St. (1916-1918). Thomas Anthony Williams (1883-1926) was not only a iron founder, but also active in New York City political life. An obituary notice in the New York Times, 25 Nov. 1926, read, "Thomas A. Williams of 147 West Ninety-ninth Street, a structural iron contractor and Democratic leader of the Ninth Assembly District, died yesterday morning at the Lutheran Hospital after an operation. His age was 43. He formerly was a member of the Board of Aldermen and had been until recently examiner for the board, a position which he relinquished in favor of one of his lieutenants. ... Mr. Williams was associated with his brother in the Thomas A. Williams Structural Iron Works, which had many important contracts. His firm did the steel work for the Polo Grounds, the new Madison Square Garden and several schoolhouses and other public buildings. . . . Mr. Williams is survived by his widow, a son, Thomas A. Jr.; two brothers and his mother." Two days later the Times included two additional notices, "Williams - Thomas A. The Executive Committee of the Democratic County Committee of New York County, Tammany Hall, with profound sorrow learns of the death of its beloved fellow-member, the Hon. Thomas A. Williams. The members of the Executive Committee will attend the funeral at his late residence, 146 West 99th St., on Saturday, Nov. 27, at 9:30 A.M. Peter J Dooling, Chairman. James F. Egan, Secretary." and "Funeral services for Thomas A. Williams, Democratic leader of the Ninth Assembly District, will be held at 10 o'clock this morning in the Church of the Holy Name, Amsterdam Avenue and Ninety-sixth Street. Mr. Williams is survived by his wife, a son, three brothers and four sisters, Mrs. T. Taguer, Mrs. Jean Smalling, Mrs. N. Berwick and Miss Margaret Williams. Governor Smith and Mayor Hague of Jersey City will attend the funeral. George W. Olvany and Peter J. Dooling will lead the Tammany delegation of mourners." In 1918 Thomas A. Williams, as an alderman from Manhattan's 13th District, was one of the supporters of the resolution that created Joan of Arc Park on Riverside Drive where the statue of Joan of Arc stands. On Thomas Williams' death the business was continued by his brother, Alexander Patrick Williams (1882-1967). From 1927 to 1949 this business was listed as Williams Iron Works at 430 E. 102nd St., Manhattan. Alexander P. Williams received the following notice in the New York Times, 28 Nov. 1967, pg. 51, "Alexander P. Williams, retired president of the Williams Iron Works, Manhattan, which erected structural steel grandstands for the Yankee Stadium, died Sunday in Richmond Memorial Hospital, Princes Bay, S. I. He was 85 years old and lived at 315 Hillside Terrace, Great Kills, S. I. Other steel structures built by the company include grandstands at Madison Square Garden, 50th Street and 8th Avenue, and at Harvard, Yale and Princeton Universities. Mr. Williams's wife, Elizabeth Lowery Williams, died in 1964. Surviving is a brother, Nicholas J. Williams." Both brothers were born in Scotland and immigrated to the U. S. as small children. They appear in the 1900 U. S. Census, ages 16 and 14, as the sons of John Williams, a day laborer, born Ireland, Dec. 1855, immigrated 1885.